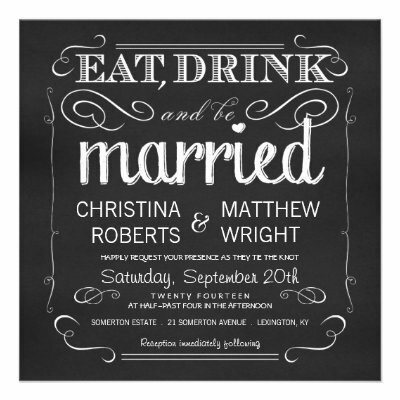 A fun, handpicked collection of refreshingly original, unique, cool, wedding invitations and save-the-date cards. One-of-a-kind, refreshing as a breath of fresh air, wedding invites for themed weddings, fun weddings, beach weddings, and more. Cool invites for the most beautiful event in one's life, the wedding! 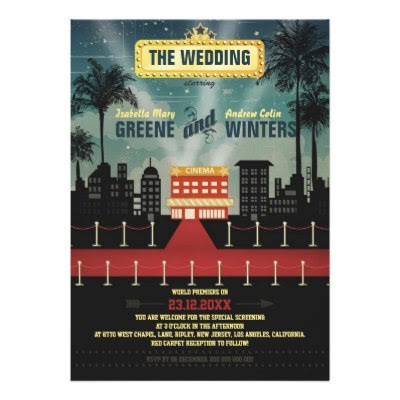 A fun, cool, movie theme wedding invitation, starring the bride and the groom! Great for fun weddings and theme weddings - movie themed weddings, red carpet themed wedding! 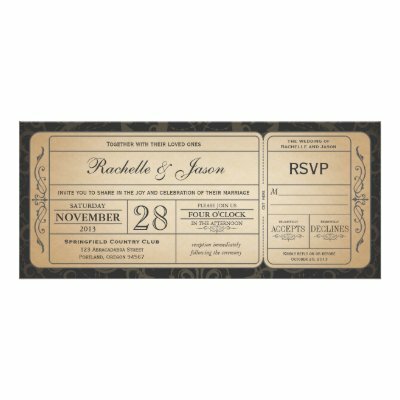 A fun, vintage ticket, wedding invite with attached RSVP! 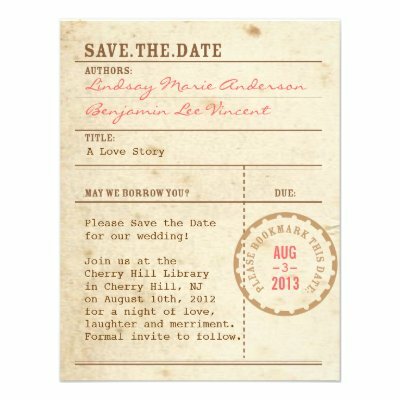 A fun, whimsical, vintage inspired wedding invite, designed like an authentic library card! 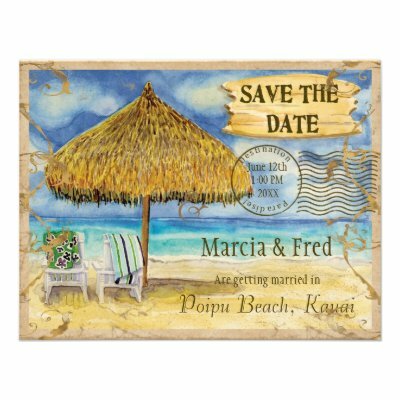 A fun and bright tropical beach wedding invite, featuring a grass leaf palappa, adirondak chairs and beach towels with a beautiful blue tropical ocean lapping at the sand! 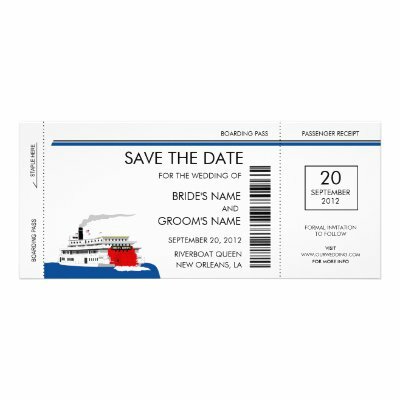 A cool red and blue, fun, wedding invite designed as a boarding pass for a riverboat! A fun, unique, wedding invitation, designed as an an opened passport! Makes a great wedding invite for couples who love travel. 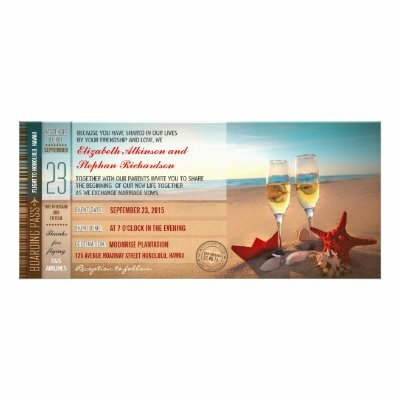 A beautiful, fun, romantic wedding invite designed as a boarding pass ticket with red starfish in the sand at the beach, white sea shells, paper boat, a beautiful sunset, and two sparkling glasses of champagne! When ordering, you customize them with your wedding, venue, and contact details. You may also change the paper type & style of these invitations. Each invitation comes with its own envelope. And you get automatic volume discount on an order of 25 or more invitations.